Almost everything you buy will have caused the emission of greenhouse gasses that drive climate change. 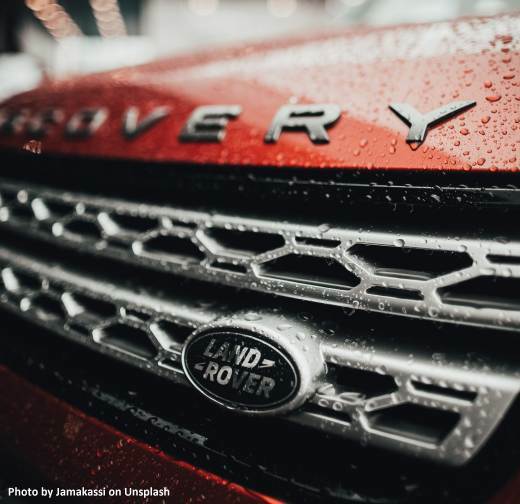 Mike Berners-Lee has estimated that for every £1000 you spend on a new car, its production has caused the emission of 636 Kgs of CO2 – plus some other greenhouse gasses [Note 1]. The Global Carbon Project has estimated that, in 2017, for every £1000 spent in the world, an average of 422 Kgs of CO2 were emitted. [Note 2] The amount of CO2 emitted for each £1000 spent is called the emissions intensity of production. The global trend in emissions intensity has been -2.0% of its 2017 value. This rate of fall (-2.0% is a fall) has been fairly steadily for 30 years or so. At this rate it would reach zero in 50 years. Fall in emissions intensity. A fuller diagram is in Note 3. Because climate science is not exact, the report takes gives three estimates of the remaining carbon budget with probabilities of their being correct. These are three estimates of remaining carbon budgets for keeping within the 1.5°C limit. Budgets for probabilities 33%, 50% and 66% were estimated. According to the Global Carbon Budget 2018, global CO2 emissions for 2018 were 42.2 billion tonnes of CO2. This would exhaust the 50% chance, 1.5°C carbon budget in 13 years. [Note 9] To keep within this budget with a steady (i.e. linear) fall in emissions, it would be necessary for emissions to fall by 1.65 Gt CO2 per year, 3.9% of current emissions. This would reach zero emissions in 2044. To save us from climate disaster degrowth is required. The general gist of the infographic should not surprise: The rich spend more, consume more and have more produced for them. Consequently they are the cause of more greenhouse gas emissions. What may be a surprise is the size of the difference between rich and poor. 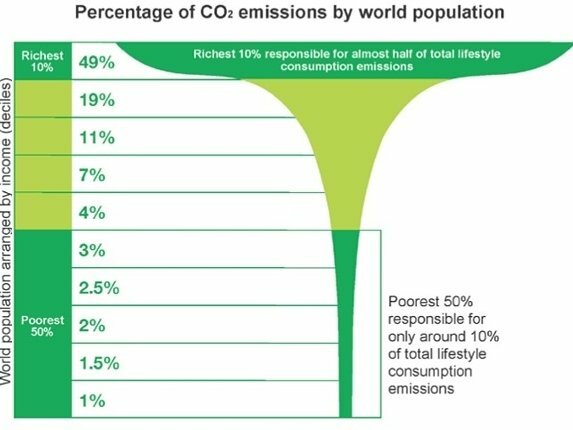 The most affluent 10% of the world population cause nearly half of the emissions but the poorest half of the world cause only 10% of the emissions. 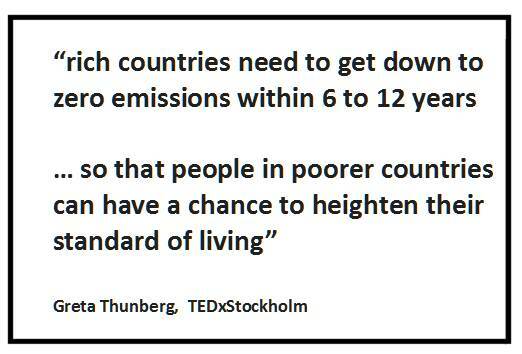 To cut emissions in a substantial way, it is clear that emissions from the rich must be lowered substantially. This means cutting their consumption. Worldwide, the rich must be worse off, until the time when the intensity of emission can be substantially lowered – as the prominent climate activist Greta Thunberg has noted. In Appendix: Worries on climate science, I worry that the result that the world economy must shrink by 1.9% a year is an underestimate and the affluent must cut their consumption substantially. Part 2 will discuss the policy of ‘inclusive growth’ promoted by the Joseph Rowntree Foundation and their approach to climate change. 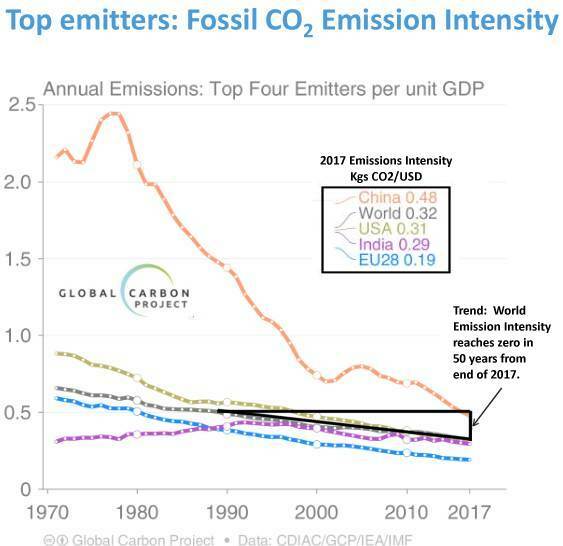 The Global Carbon Budget 2018 gives the carbon intensity of production as 0.320 kgs CO2/USD (See graph Top emitters: Fossil CO2 Emission Intensity). A conversion rate of 1.32 USD to 1 GBP is used to give 422 kgs CO2 per £1000. According to the Global Carbon Budget 2018, global CO2 emissions for 2018 were 42.2 billion tonnes of CO2 (i.e. 42.2 Gt CO2 with 37.1 Gt CO2 from fossil fuels and 5.1 Gt CO2 from Land Use Change). If these fell steadily to zero over 49 years from the end of 2018, emissions would be 1033 Gt CO2. In this article I will assume that spending, consumption and production are being equal. Not strictly correct but good enough for the argument here. Other greenhouse gasses, such as methane and nitrous oxide, are often assumed to be in a proportional relation with CO2 so may be treated separately. See Note 1 above. Table 2.2 mentions “additional earth system feedbacks” such as carbon emissions from melting tundra. If these are taken into account the remaining carbon budget for the 50% chance of keeping below 1.5C in 13 years reduces to 438 Gt CO2. The Mercator Carbon Clock has a figure of less than 9 years to reach the 1.5C limit. They have used the remaining carbon budget for a 66% probability of keeping within this limit. I used the limit for 50% probability giving a larger estimate of 13 years. Here is the Table 2.2 extract again. The percentage rates here are given with respect to the values in 2017. In this article I have used the middle value in SP15 Table 2.2 for the remaining carbon budget for a 1.5°C rise in temperature – the value designated as a 50% chance. In addition, I have not deducted the 100 Gt CO2 predicted for the emissions from melting permafrost. This means the required degrowth of 1.9% may be considered an underestimate. I have followed climate science for a few decades now and had the opportunity of meeting and corresponding with climate scientists, related experts, politicians and government officials. I have become aware of the gap between politics and the physics of climate change. In general, there are political pressures to downplay the dangers of climate change. With UK government departments, I have found a reluctance to confront climate issues on topics like climate feedbacks, the carbon footprint of cattle and embodied carbon in buildings. Although the differences between the different methods of reporting UK’s carbon emissions are quite well known, it is disappointing to see the Department of Business, Energy and Industrial Strategy strongly promoting the measure that ignores the embodied carbon in imports. Basically UK Government downplays climate change. The basic issue is that the effort to reduce emissions sufficiently to never get past 1.5ºC would require a global effort to decarbonize starting immediately that would dwarf current efforts or pledges. This seems unlikely (IMO). Gavin Schmidt is one of the most respected climate scientists in the world. His comments should mean that the estimates above for a degrowth rate of 1.9% may be rather too small. To achieve this the world’s affluent must cut their consumption substantially.